In prosody, alliterative verse is a form of verse that uses alliteration as the principal structuring device to unify lines of poetry, as opposed to other devices such as rhyme. The most intensively studied traditions of alliterative verse are those found in the oldest literature of many Germanic languages. Alliterative verse, in various forms, is found widely in the literary traditions of the early Germanic languages. 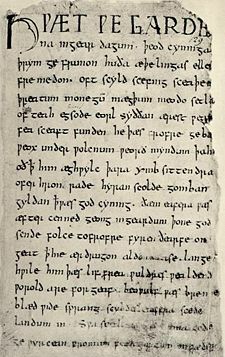 The Old English epic Beowulf, as well as most other Old English poetry, the Old High German Muspilli, the Old Saxon Heliand, and the Old Norse Poetic Edda all use alliterative verse. Alliterative verse can be found in many other languages as well, although rarely with the systematic rigor of Germanic forms. The Finnish Kalevala and the Estonian Kalevipoeg both use alliterative forms derived from folk tradition. Traditional Turkic verse, for example that of the Uyghur, is also alliterative. The poetic forms found in the various Germanic languages are not identical, but there is sufficient similarity to make it clear that they are closely related traditions, stemming from a common Germanic source. Our knowledge about that common tradition, however, is based almost entirely on inference from surviving poetry. 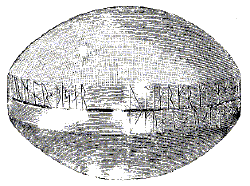 Snorri Sturluson, author of the Prose Edda, an example of alliterative verse, describes metrical patterns and poetic devices used by skaldic poets around the year 1200 C.E.. Snorri's description has served as the starting point for scholars to reconstruct alliterative meters beyond those of Old Norse. There have been many different metrical theories proposed, all of them attended with controversy. Looked at broadly, however, certain basic features are common from the earliest to the latest poetry. This inscription contains four strongly stressed syllables, the first three of which alliterate on <h> /x/, essentially the same pattern found in much latter verse. Originally all alliterative poetry was composed and transmitted orally, and much has been lost through time since it went unrecorded. The degree to which writing may have altered this oral art form remains in much dispute. Nevertheless, there is a broad consensus among scholars that the written verse retains many (and some would argue almost all) of the features of the spoken language because alliteration serves as a mnemonic device. Alliteration fits naturally with the prosodic patterns of Germanic languages. Alliteration essentially involves matching the left edges of stressed syllables. Early Germanic languages share a left-prominent prosodic pattern. In other words, stress falls on the root syllable of a word. This is normally the initial syllable, except where the root is preceded by an unstressed prefix (as in past participles, for example). A long-line is divided into two half-lines. Half-lines are also known as verses or hemistichs; the first is called the a-verse (or on-verse), the second the b-verse (or off-verse). A heavy pause, or cæsura, separates the verses. Each verse usually has two strongly stressed syllables, or "lifts." The first lift in the b-verse must alliterate with either or both lifts in the a-verse. The second lift in the b-verse does not alliterate with the first lifts. The patterns of unstressed syllables vary significantly in the alliterative traditions of different Germanic languages. The rules for these patterns remain controversial and imperfectly understood. The need to find an appropriate alliterating word gave certain other distinctive features to alliterative verse as well. Alliterative poets drew on a specialized vocabulary of poetic synonyms rarely used in prose texts and used standard images and metaphors called kennings. Old English poetry appears to be based upon one system of verse construction, a system which remained remarkably consistent for centuries, although some patterns of classical Old English verse begin to break down at the end of the Old English period. The most widely used system of classification is based on that developed by Eduard Sievers. It should be emphasized that Sievers' system is fundamentally a method of categorization rather than a full theory of meter. It does not, in other words, purport to describe the system the scops actually used to compose their verse, nor does it explain why certain patterns are favored or avoided. Sievers divided verses into five basic types, labeled A-E. The system is founded upon accent, alliteration, the quantity of vowels, and patterns of syllabic accentuation. The first stressed syllable of the off-verse, or second half-line, usually alliterates with one or both of the stressed syllables of the on-verse, or first half-line. The second stressed syllable of the off-verse does not usually alliterate with the others. A feir feld full of folk || fond I þer bitwene, Of alle maner of men, || þe mene and þe riche, Worchinge and wandringe || as þe world askeþ. Among them I found a fair field full of people All manner of men, the poor and the rich Working and wandering as the world requires. Alliteration was sometimes used together with rhyme in Middle English work, as in Pearl. In general, Middle English poets were somewhat loose about the number of stresses; in Sir Gawain, for instance, there are many lines with additional alliterating stresses (e.g. l.2, "the borgh brittened and brent to brondez and askez"), and the medial pause is not always strictly maintained. After the fifteenth century, alliterative verse became fairly uncommon, although some alliterative poems, such as Pierce the Ploughman's Crede (ca. 1400) and William Dunbar's superb Tretis of the Tua Marriit Wemen and the Wedo (ca. 1500) were written in the form in the fifteenth century. However, by 1600, the four-beat alliterative line had completely vanished, at least from the written tradition. One modern author who studied alliterative verse and used it extensively in his fictional writings and poetry, was J. R. R. Tolkien (1892–1973). He wrote alliterative verse in modern English, in the style of Old English alliterative verse (he was one of the major Beowulf scholars of his time—see Beowulf: the monsters and the critics). Examples of Tolkien's alliterative verses include those written by him for the Rohirrim, a culture in The Lord of the Rings that borrowed many aspects from Anglo-Saxon culture. There are also many examples of alliterative verse in Tolkien's posthumously-published works in The History of Middle-earth series. Of these, the unfinished 'The Lay of the Children of Húrin', published in The Lays of Beleriand, is the longest. Another example of Tolkien's alliterative verse refers to Mirkwood (see the introduction to that article). Outside of his Middle-earth works, Tolkien also worked on alliterative modern English translations of several Middle English poems by the Pearl Poet: Sir Gawain and the Green Knight, Pearl, and Sir Orfeo. These were published posthumously in 1975. In his lifetime, as well as the alliterative verse in The Lord of the Rings, Tolkien published The Homecoming of Beorhtnoth Beorhthelm's Son in 1953, an alliterative verse dialogue recounting a historical fictional account of The Battle of Maldon. Now the news. Night raids on Five cities. Fires started. Pressure applied by pincer movement In threatening thrust. Third Division Enlarges beachhead. Lucky charm Saves sniper. Sabotage hinted In steel-mill stoppage. . . . Many translations of Beowulf use alliterative techniques. Among recent ones that of Seamus Heaney loosely follows the rules of modern alliterative verse while the translation of Alan Sullivan and Timothy Murphy follows those rules more closely. The various names of the Old Norse verse forms are given in the Prose Edda by Snorri Sturluson. The Háttatal, or "list of verse forms," contains the names and characteristics of each of the fixed forms of Norse poetry. þann's Svafrlama || slógu dvergar. Fornyrðislag has two lifts-per-half-line, with two or three (sometimes one) unstressed syllables. At least two lifts, usually three, alliterate, always including the main stave (the first lift of the second half-line). Fornyrðislag had a variant form called málaháttr ("speech meter"), which adds an unstressed syllable to each half-line, making six to eight (sometimes up to ten) unstressed syllables per line. (Long is one night, long is the next; how can I bear three? A month has often seemed less to me than this half "hýnótt" (word of unclear meaning)). A number of variants occurred in ljóðaháttr, including galdraháttr or kviðuháttr ("incantation meter"), which adds a fifth short (three-lift) line to the end of the stanza; in this form, usually the fifth line echoes the fourth one. These verse forms were elaborated even more into the skaldic poetic form called the dróttkvætt, meaning "lordly verse," which added internal rhymes and other forms of assonance that go well beyond the requirements of Germanic alliterative verse. The dróttkvætt stanza had eight lines, each having three lifts. In addition to two or three alliterations, the odd numbered lines had partial rhyme of consonants (which was called skothending) with dissimilar vowels, not necessarily at the beginning of the word; the even lines contained internal rhyme (aðalhending) in the syllables, not necessarily at the end of the word. The form was subject to further restrictions: each half-line must have exactly six syllables, and each line must always end in a trochee. The bracketed words in the poem ("so said the goddess of hawk-land, true of words") are syntactically separate, but interspersed within the text of the rest of the verse. The elaborate kennings manifested here are also practically necessary in this complex and demanding form, as much to solve metrical difficulties as for the sake of vivid imagery. Intriguingly, the saga claims that Harald improvised these lines after he gave a lesser performance (in fornyrðislag); Harald judged that verse bad, and then offered this one in the more demanding form. While the exchange may be fictionalized, the scene illustrates the regard in which the form was held. Most dróttkvætt poems that survive appear in one or another of the Norse Sagas; several of the sagas are biographies of skaldic poets. hallar dróttinn of mér stalli. I ask the tester of monks (God) for a safe journey; the lord of the palace of the high ground (God—here we have a kenning in four parts) keep the seat of the falcon (hand) over me. The author was said to be a Christian from the Hebrides, who composed the poem asking God to keep him safe at sea. (Note: The third line is, in fact, over-alliterated. There should be exactly two alliterants in the odd-numbered lines.) The meter gained some popularity in courtly poetry, as the rhythm may sound more majestic than dróttkvætt. Alliterative poetry is still practiced in Iceland in an unbroken tradition since the settlement. The Old High German and Old Saxon corpus of alliterative verse is small. Less than 200 Old High German lines survive, in four works: the Hildebrandslied, Muspilli, the Merseburg Charms and the Wessobrunn Prayer. All four are preserved in forms that are clearly to some extent corrupt, suggesting that the scribes may themselves not have been entirely familiar with the poetic tradition. The two Old Saxon alliterative poems, the fragmentary Heliand and the even more fragmentary Genesis are both Christian poems, created as written works of [[The Bible}Biblical]] content based on Latin sources, and not derived from oral tradition. However, both German traditions show one common feature which are much less common elsewhere: a proliferation of unaccented syllables. Generally these are parts of speech which would naturally be unstressed—pronouns, prepositions, articles, modal auxiliaries—but in the Old Saxon works there are also adjectives and lexical verbs. The unaccented syllables typically occur before the first stress in the half-line, and most often in the b-verse. helidos, ubar hringa, do sie to dero hiltiu ritun. the heroes, over ringmail when they to that fight rode. Blessed are you Simon, he said, son of Jonah; for you did not see that yourself (Matthew 16, 17). This leads to a less dense style, no doubt closer to everyday language, which has been interpreted both as a sign of decadent technique from ill-tutored poets and as an artistic innovation giving scope for additional poetic effects. Either way, it signifies a break with the strict Sievers typology. Selected Poetry and Prose of Jónas Hallgrímsson – A good site altogether, but see in particular Appendix B for probably the most accessible discussion in English of alliterant placement in modern Icelandic. Forgotten ground regained – A site dedicated to alliterative and accentual poetry.